The Miss Tibet Pageant 2017 was held at TIPA in McLeod Ganj, India, on 2 to 4 June 2017. This year's Miss Photogenic was Tenzin Paldon. McLEOD GANJ, India, 13 November 2017, MissTibet.com Miss Tibet Tenzin Paldon is among 60 contestants vying for the crown of the Miss Global Pageant, taking place in Phnom Penh, the capital of Cambodia. McLEOD GANJ, India, 5 June 2017, MissTibet.com Three judges decided Tenzin Khechoe the First Runner-up after seven rounds over three days, while Tenzin Nordon was judged the Second Runner-up. MCLEOD GANJ, India, 4 June 2017, MissTibet.com Talk and Talent rounds were held last night, in which the contestants stunned a packed TIPA Hall. 9 June 2017, ON THE WEB The winner received a money prize and free travel award. 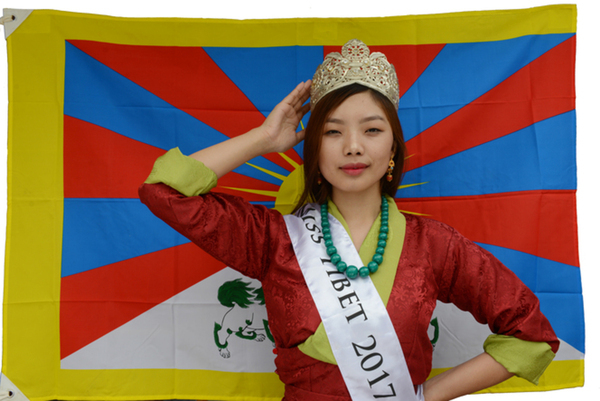 She is expected to make event appearances and represent Tibet in international pageants. 6 June 2017, MCLEOD GANJ, India With this feat, Paldon is hopeful of taking her win international and apprising the world of Tibetan culture, its issues and causes. 5 June 2017, MCLEOD GANJ, India Organising Miss Tibet Pageant for the last 15 years, Lobsang Wangyal, Tibetan social entrepreneur, announced his intention to withdraw and sell the pageant.